The 1920’s saw the beginning of the modern kitchen. Social changes integrated with new technology, mainly the availability of electricity and natural gas to homes, slowly brought about these greatly different kitchens during the early decades of the 20th century. 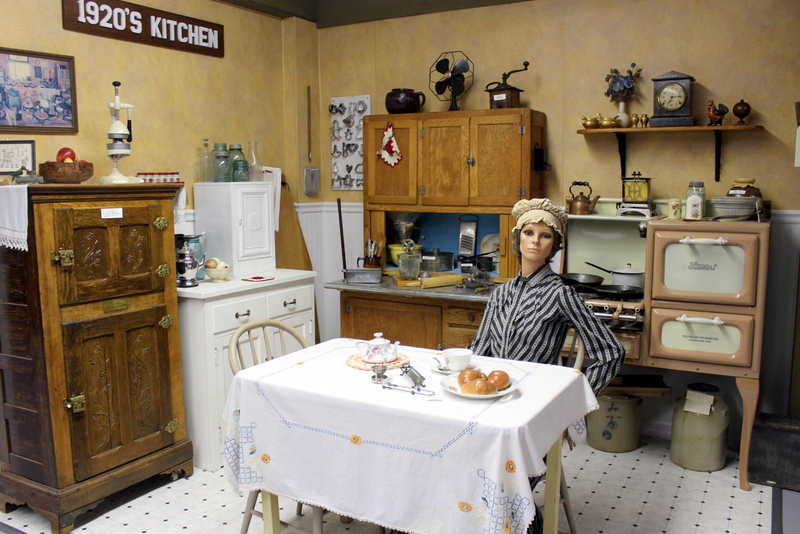 The kitchen became the realm of the fashionable housewife encouraged by the women’s emancipation movement, the loss of domestic help and a trend toward smaller homes. While some housewives desired large, old-fashioned kitchens, writers and designers touted practical housekeeping with smaller, efficient and healthful kitchens. They suggested placing major appliances more logically around the room to help eliminate unnecessary walking. Before the 1920’s, kitchens had detached pantries and cupboards, little storage and no countertops. The Hoosier, a name first started by a company in Indiana, was a bulky, free-standing cabinet that had built-in bins for staples and a slide-out counter for food preparation. Our Hoosier has a flour bin (upper left) with a sifter below, spice rack, sliding shelves for storing large mixing bowls and other drawers for kitchen utensils. By grouping together kitchen essentials, the Hoosier was a perfect addition to the smaller kitchen. Until the late 1920’s and beyond, the icebox was used to keep food cool. This required a weekly visit by the iceman to place a huge block of ice, locally harvested from Lake Waubesa in the winter, in the top compartment. Cold air circulated down and around items in the lower storage compartment. A drip pan collected the melt water and had to be emptied daily. Iceboxes were generally made of wood, most probably for ease of construction, insulated with cork or sawdust a nd lined with zinc or tin. Many were handsome pieces of furniture. An exclusive oak cabinet icebox, such as our Greenland model manufactured for Hibbard, Spencer, Bartlett & Co.*, would be found in the well-to-do homes. Note the fancy hardware and latches. The coming of electricity to each village and town across the country brought major changes to the kitchen. Electric lights replaced kerosene lamps and electric percolators, toasters, irons and other appliances made the housewife’s chores much simpler. One of the biggest changes in the 1920’s when electricity came to McFarland was the electric refrigerator. Though it was small and expensive, the electric refrigerator was a big improvement over the icebox. Early models had a compression refrigeration system exposed on the top. Note the photo on the left of the General Electric “Monitor-Top” refrigerator introduced in 1927. Our display kitchen does not feature a new electric refrigerator and instead has an icebox that was much less expensive. In the 1920’s the kitchens were functional with few decorative touches. There was a mania for sanitation in a society made aware by WWI that bacteria and germs caused illnesses. Surfaces were light and easily cleaned. Walls were often painted white, but light green or yellow were popular colors and earth tones became stylish. Freestanding cabinets and cupboards were painted white. Many walls were covered with washable tiles or with painted wainscot tongue and groove boards below the chair rail. Floors were covered with easy-to-clean linoleum, which was often designed with squares and checkerboard patterns. Porcelain enamel appeared on many surfaces including tabletops, stoves, pots and pans. With a growing interest in nutrition and sanitation, many changes were made to develop kitchens that were efficient and healthful. While they were small, the 1920’s kitchen became the most important room in the modern home.